Welcome to the most beautiful town in the country – St Ives! Our history is awash with smugglers, miners, fisherman, pioneers and artists. Our food is unforgettable, from our world-renowned Cornish pasties and traditional cream teas, to the freshest of fish and the creamiest of ice creams. St Ives will delight and inspire the most discerning palette. Our scenery is breathtaking, from our award-winning beaches, where the softest of sands entice you to paddle, swim or surf, to the most amazing views along the South West Coast path that rival ANY in the world. There are simply not enough superlatives to do it justice. Come see for yourself. Welcome to Guided Tours of St Ives – we are here to help to make your visit as enjoyable, informative and memorable as possible. We offer a range of leisurely walking tours around St Ives, aiming to give you some insights into the history, the art and the people of this beautiful town at the Western end of the Cornish peninsula. Our walking tours operate throughout the year, with ‘drop-on’ tours running on Wednesdays at 11am from April until the end of October. There’s no need to book, just pop along to our meeting point outside the Guildhall and join the group*. Our most popular tour is ‘The Story of St Ives’ tour. This tour offers a good introduction to the historical background of the town. We discuss our rich mining heritage, the pilchard fishing industry, the vibrant art colony (past and present), tourism, religion, food, tides, coastal walks, lighthouses, Cornish names and even smuggling! This is the tour you will join if you come along on a Wednesday morning. If you have a particular interest in how St Ives came to be one of the most prominent art colonies in the world, we can also offer the ‘Artists of St Ives’ tour. This tour takes in the fascinating history of the artists. Why and when they first arrived, and the colourful characters who contributed so much to the town, including Barbara Hepworth, Bernard Leach, Alfred Wallis, Ben Nicholson and Bryan Pearce. We will also discuss and search for the elusive ‘pink light’ that St Ives is so renowned for. The pace is gentle on both tours and normally takes about 90 minutes. We walk around the narrow lanes and alleys of the town and our route is mainly on the flat and is just over a kilometre. The tour takes in several areas of interest including the Barbara Hepworth museum, the Church, the town gardens, Smeatons Pier, the Smugglers Arch, The Island, the Tate, and several beaches. Questions are encouraged throughout the tour. If you have any questions or would like to book a private tour please call Dawn 0n 07816 180639. 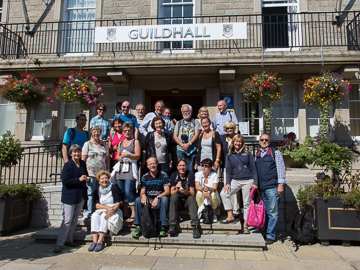 Meet: Outside The Guildhall on Street-an-Pol (follow the signs to the Visitor Information Centre). Cost: £7.50 per person, payable to the Guide on the day (cash or card). Families are welcome and children under 12 are free. Dogs are also welcome but please note that access to the Guildhall for the first five minutes of the tour may be restricted depending on Town Council business. Please call Dawn on 07816 180639 for further information. All walking tours run subject to a minimum attendance of four people. Please check in advance that tours are running if you are coming especially for the walking tour – just call Dawn or check the Guided Tours Facebook Page for latest info.